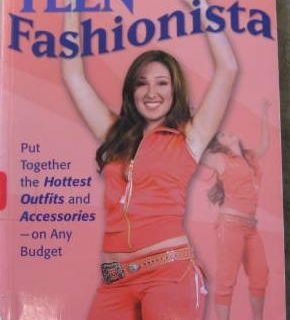 The Fashion Guide for Teens! I was actually impressed that this book was in such good condition since it is over 20 years old. Not a bad collection choice for the 1988. Lots of diagrams and photos and a nice message of “be yourself”. Of course fashion has a shelf life people. Let the archives save this stuff for posterity. In the meantime, enjoy the stroll down memory lane. Holly, I am sure this was your book in high school! Previous Post:Out of the body or out of the library? @L.B. Seriously…I expect such shenanigans in a diet ad, but what’s the point of them here? Is it so important for the authors that teens believe them, even if the effect is subtle? 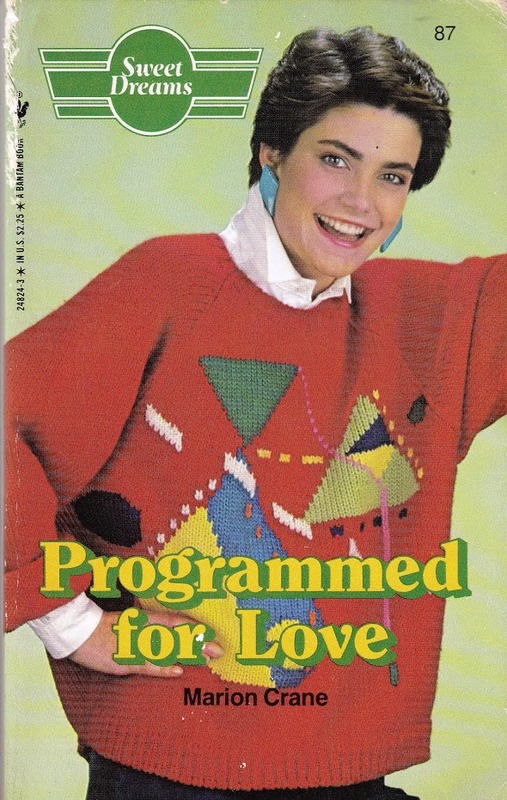 The model on the cover is so excited… so excited… SHE’S SO SCARED! And why is Carlton Banks carrying around a phone receiver in the “The Classic” photo? That’s not even a big 1980s cell phone; it’s just a receiver attached to nothing! 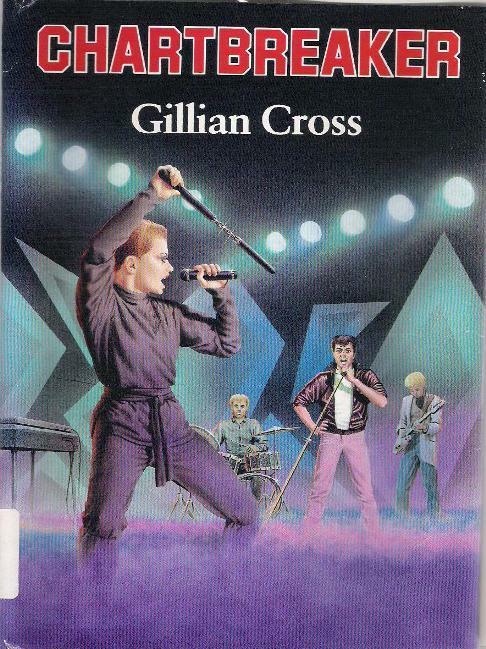 Oh, this book would have made me so mad back then. I’m an Autumn, and we are often ignored because there aren’t as many of us. 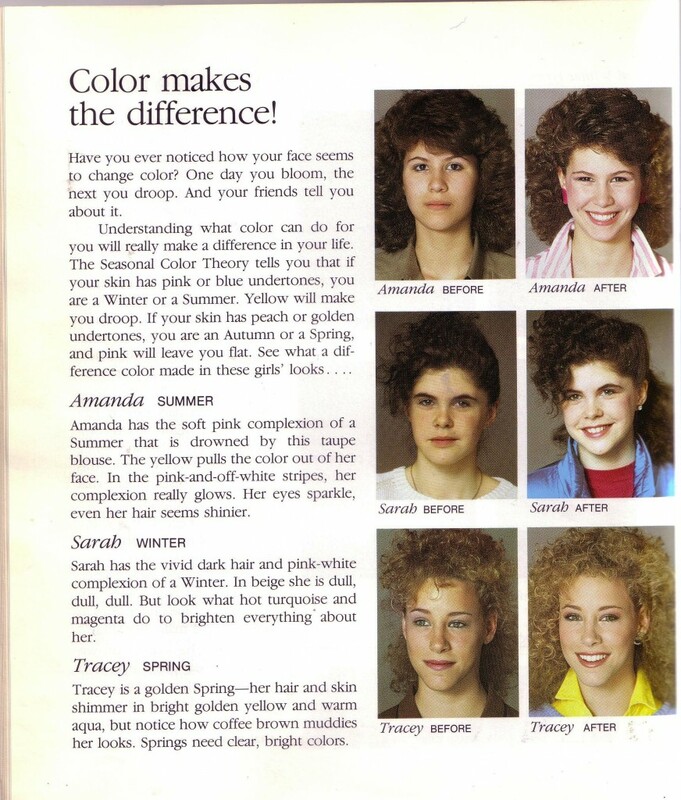 The color/season thing was such a big deal in the 80s. See, I think this should be kept and prominently displayed as a cautionary tale to Those Kids Nowadays with their cool, retro-80s fashion. This is what people were REALLY wearing back then, kids! Be afraid…be very afraid. The Classics are now college professors, wearing exactly the same thing! And some are STILL talking on disconnected receivers! Seriously, doesn’t the biology dude look exactly like a professor? That bio textbook is highly suspicious. It’s about the size and thickness of a good board book, and appears to involve fortune cookys. @Polly – HEY! I liked the shapeless blazer! And all my hair came up over one side and down the other. I styled it by spraying mega-hold hairspray on it WHILE I was blow-drying it, remember those styles? A tornado wouldn’t have dislodged the right side of my hair. I’m all for the return of 80s prep fashion. 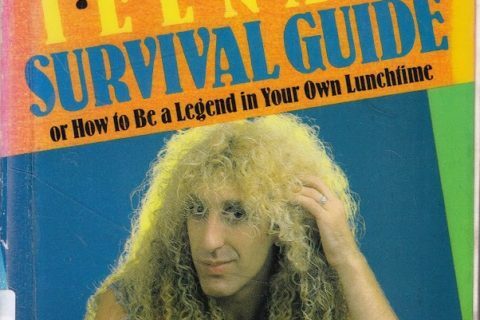 And even some of the other stuff – just no hair metal chic, please. 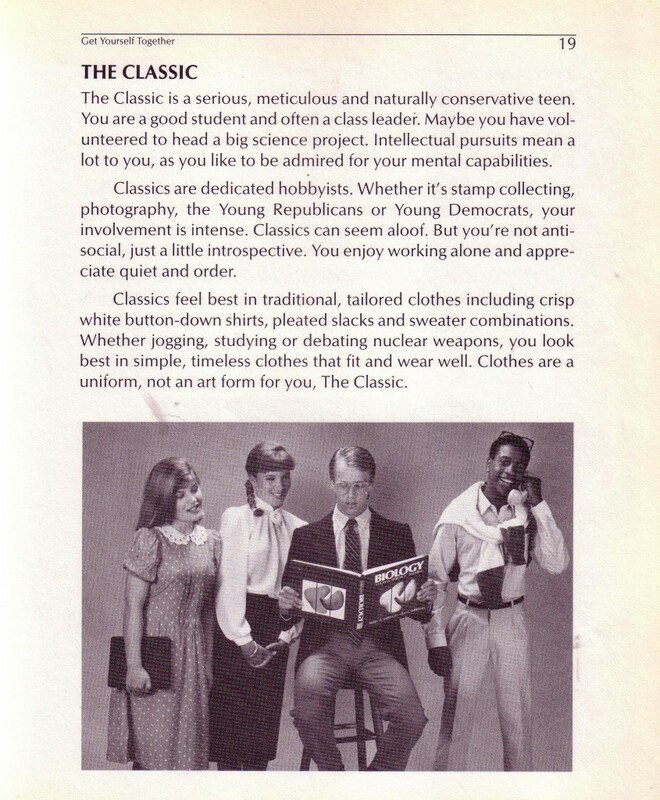 I was a total “classic” in high school–or as we called it, “preppie”. Those are actually pretty fashionable outfits. I was more of a plaid skirt, monogrammed shetland sweater over an oxford shirt, gold hoops, and oxblood loafers girl. 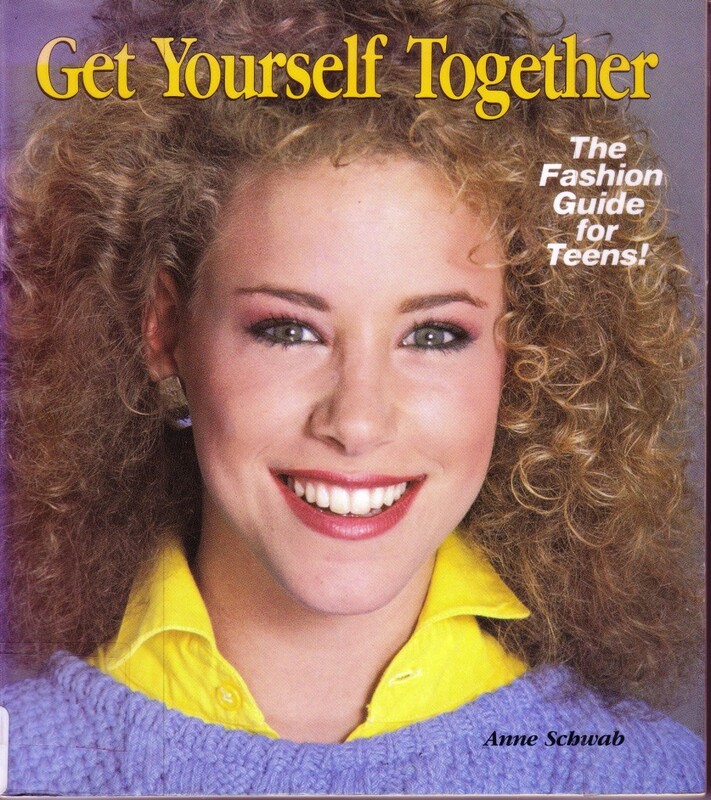 This must have been the fashion guide for “Saved by the Bell”! O the Glory that was ’80s hair! That one girl is wearing a Prairie skirt! Which wasn’t actually in fashion by ’86, really. That’s more of a 1981-82 thing. That’s when I wore MY prairie skirt anyway. With a big ol’ blouse, thank you very much. I also had the shamefully poofy hair. And a toats cool jean jacket with badges all over that said things like ‘grody to the max’ and ‘Adam Ant!’ and similar, because I was super cool and awesome in the 80s. Dear Lord, this just looks like a walk through my old school album. I am sure I have owned at least one outfit from each picture. The prairie skirt with the sweater and flats oh I had many of them. I always wonder why we so loved the shapeless outfits that added a good 10-15lbs. @Prunella – Maybe Autumns are so perfect they don’t need to do anything. Maybe Autumns are what us other poor seasons have to aspire to be. I think the big thing she could not grasp was that I learn more from seeing and doing things then reading or hearing. These books were of no help. Just like her verbal instructions on how to iron do me no good. I need to be shown and have a chance to practice it. I don’t normally go for book burning, but could you burn this one after weeding it in honor of 80’s Jami who was forced to read crap like this? Now I know why I wasn’t so popular! No,please,this stuff reeks…Most of the people I knew wore thrift store clothes,recycled punk clothes and Madonna like outfits in the early to mid 80’s.I think we even shopped at Army Surplus stores even,because the clothes were kind of cool. This screams all conservative,preppy! We didn’t like those people,so sickly sweet looking! I’m sad I spent the tail end of this glorious decade in diapers, I missed out on so much colour!